After Rev Alexander Macleod and the entire congregation left the established Church in 1843 for the Free Church, the manse at Baile na Cille was vacant for nearly two years. 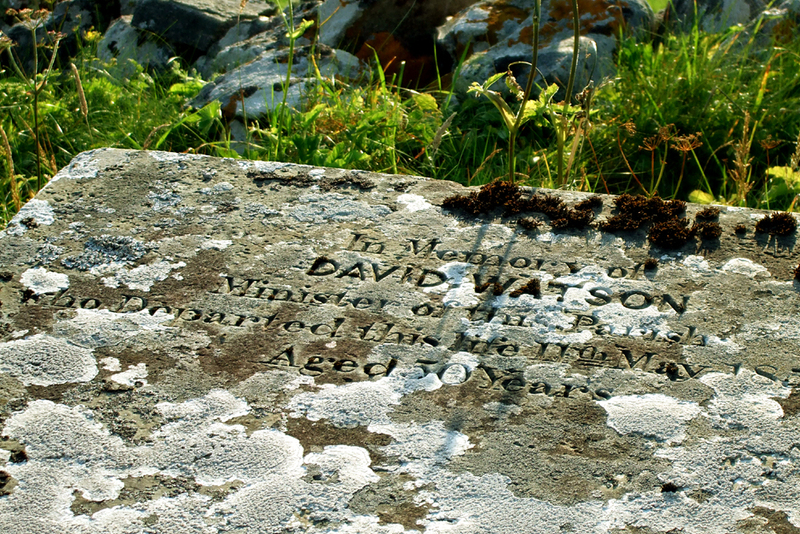 In 1845, David Watson, a native of Croy, educated in Aberdeen, was received as a probationer and required to preach in Uig on 16 February 1845, although on account of the difficulty in obtaining a ferry from Callanish to Uig (the whole area being strongly “Free”) he preached on 4 March at the house of the tacksman at Linshader, Murdo Macaulay and his wife, who were the only adherents in the area. The following day the Presbytery came out to Callanish and were also unable to get a boat to Uig. Mr Lees, the Stornoway minister, reported that “when half way over they found the plug had been taken out of the boat and they narrowly escaped being drowned.” They met instead at the schoolhouse at Callanish, along with Mr Scobie the Chamberlain, and agreed to the ordination of Mr Watson. There was no regular Kirk session in Uig in Mr Watson’s time as he had no suitable men who were members of the Church. Indeed the Sacrament of the Lord’s Supper had not been dispensed at all in the five years up to 1852. One suspects that outside those associate with the manse, there was no congregation to participate in the Sacrament. It is clear that throughout most of his time in Uig, Mr Watson was in indifferent mental health. The Presbytery stated in 1852 that the state of his healthy often interfered with the regular discharge of his duties. The Chamberlain of the Lews states that on one occasion when he called to see Mr Watson he was rather ill and disturbed in his mind about his farm. Again in May 1853 he sought leave of absence from the Presbytery for a period of 27 minths in the hope that his health would improve. The members being conversant with his broken health granted his request. Murchadh Chaluim Sheoras (Murdo Macleod Crowlista) told of the confrontation between Mr Watson and bodaich a’bhaile againn fhein over the driving of the Crowlista cattle back and fore across the Baile na Cille glebe boundary. He also told of legal confrontations between Mr Watson and the next Chamberlain, Donald Munro, relation to land questions, and suggested that such involvement in contentious issues must have contributed towards his illness and his tragic death at Baile na Cille. On 11 May 1856 a prayer meeting at Bonn na Lonaig, Crowlista, led by the Free Church minister John Campbell, was interrupted by the news that Mr Watson had hanged himself in an outhouse at the manse. Mr Campbell and some of the men made off across Traigh na Sruban towards Baile na Cille; the body had been discovered by a maid. Mr Watson was buried in the cemetery at Baile na Cille. His widow Margaret Mackay moved to Ness with their children (aged 13, 10, 5 and 1 in 1856); his eldest son William became a schoolteacher, a professor of mathematics at Edinburgh, and then a minister, and his third son Alexander became a physician.